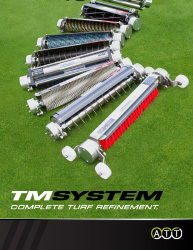 a 'complete' fine turf refinement system. 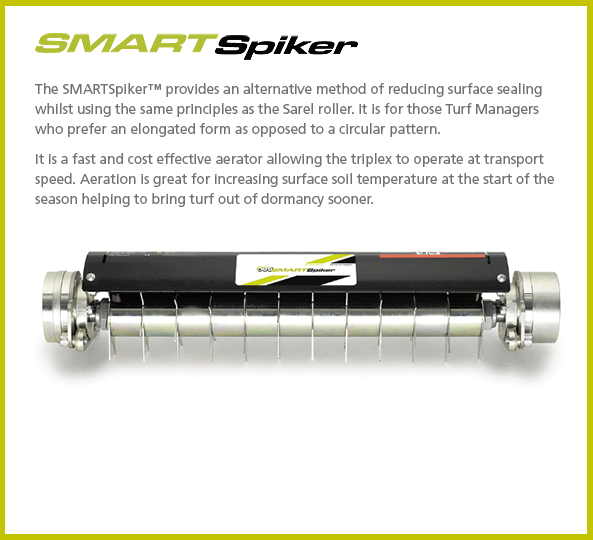 Versatile equipment that saves the need to buy individual machines – forget your tractor-mounted PTO driven de-thatcher, spiker/sarel roller, drag brush or sweeper/collector and dispense with a separate pedestrian scarifier. 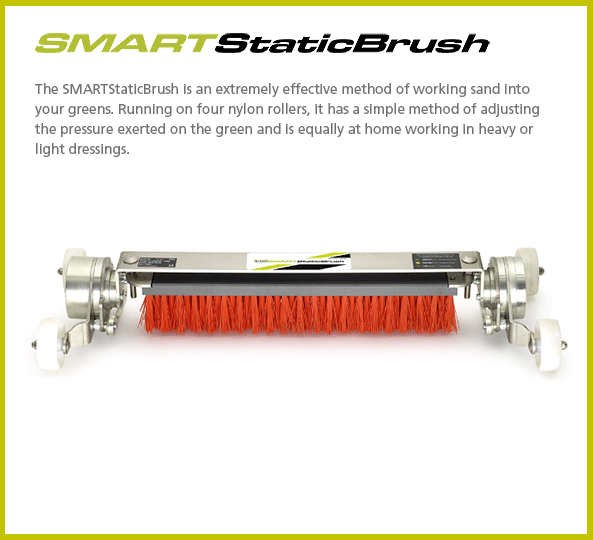 The TMSystem™ is unique, it has several exclusive SMART cassettes that will tackle everyday problems experienced on a golf course. 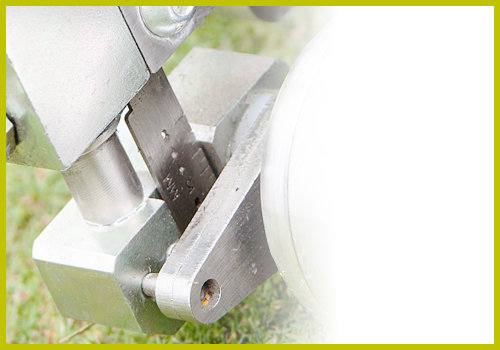 Using the appropriate chassis adaptor kit, the system is fully compatible with all main-stream makes of triplex greens mowers and lightweight fairway mowers, like John Deere, Jacobsen and Toro. 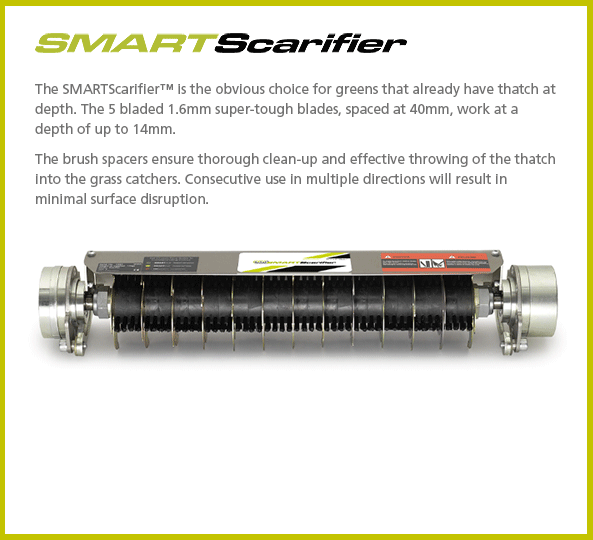 ATT’s TMSystem™ brings fine turf quality to sports turf maintenance with a range of SMART cassettes. Versatile equipment to bring more flexibility to fairway and triple greens mowers – saving the need to buy individual machines. 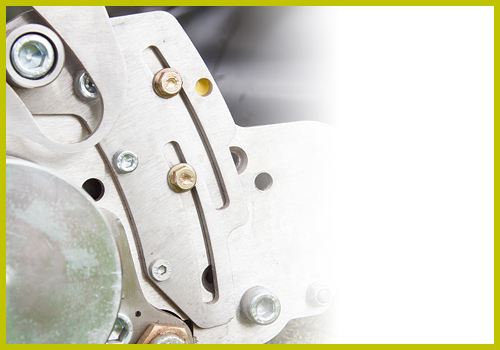 The TMSystem™ unlocks the full potential of your John Deere, Toro or Jacobsen fairway or triple greens mower achieving more functionality by replacing the OEM cutting reels with ones specific to applications. 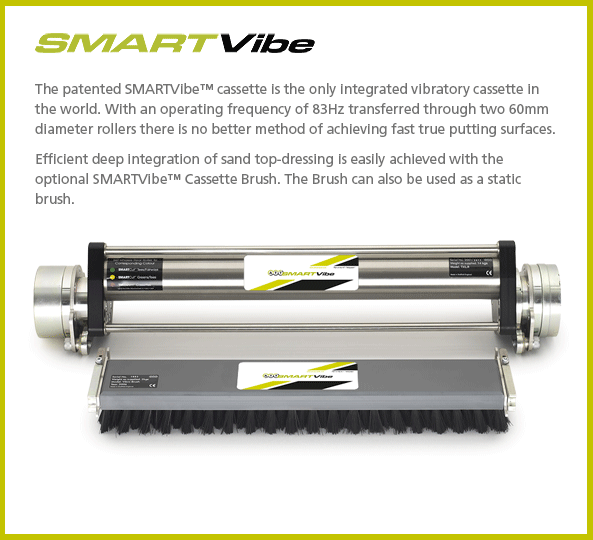 There are 9 SMART cassettes – perfect for verticutting, shallow solid tining, brushing etc. 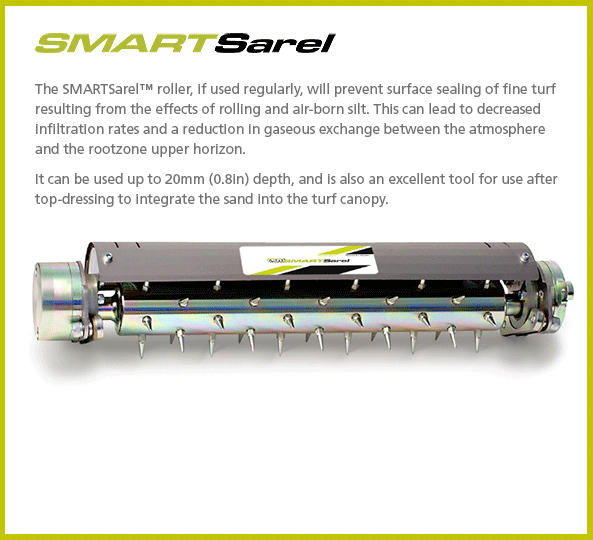 to improve the health and playability of sports turf surfaces and achieve better overall surface quality and appearance. 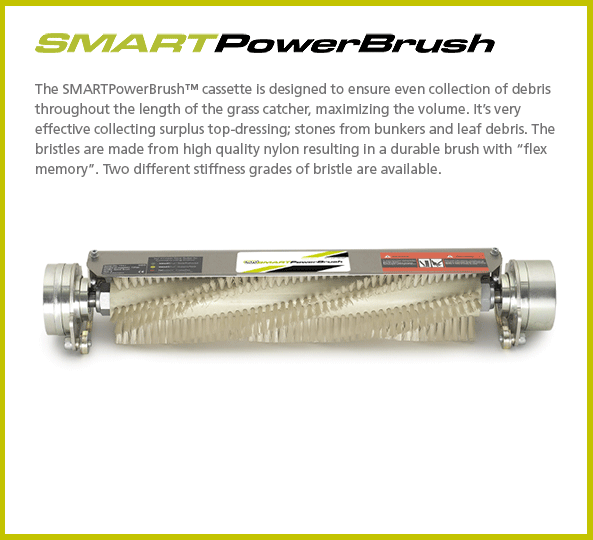 Whatever the objective is, ATT’s Turf Management System™ has the appropriate SMART cassette to meet the needs of the modern day turf maintenance professional. 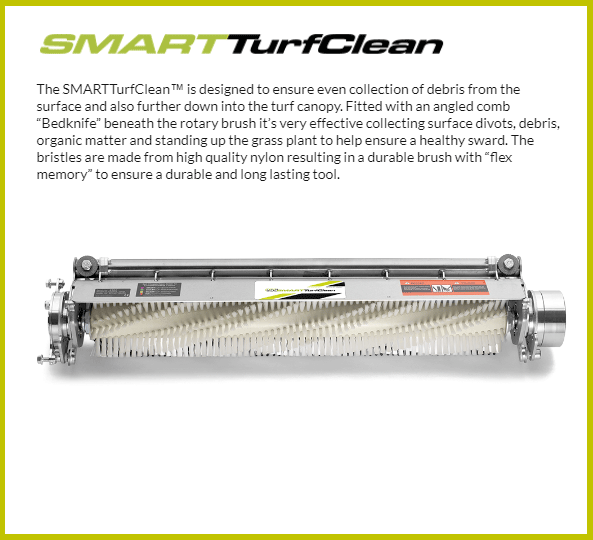 Whether the objective is organic matter reduction, grain control, soil gas/air exchange, green speed manipulation, or just top-dressing integration there is an appropriate greens maintenance cassette to meet the need. 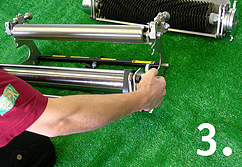 The foundation of the ATT Turf Management System™ is the chassis. addition of the appropriate carrier bracket. operation is being carried out. gearbox and rotate the brush. 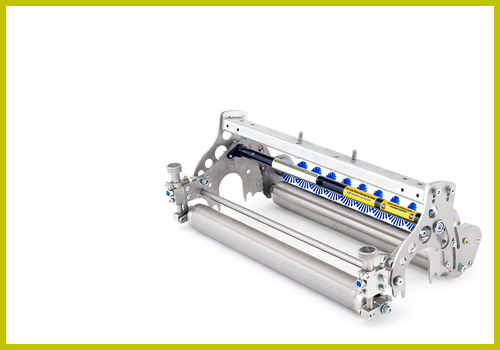 in better fuel efficiency/battery life and less wear on components. Slide new cassette into chassis. 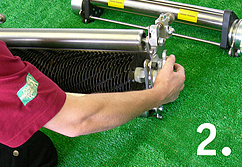 Ergonomically designed, four bolt, “Easy-In-Easy-Out” cassette change-over. 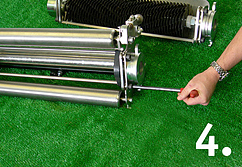 Installation and removal in 10 seconds. 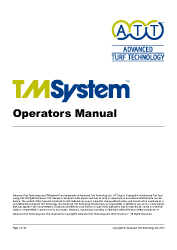 Click the button below to download the TMSystem™ Operators Manual. 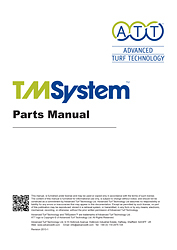 Click the button below to download the TMSystem™ Parts Manual. 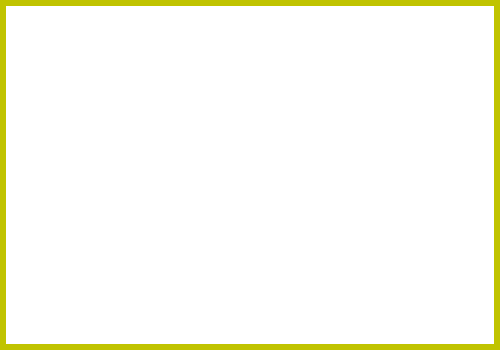 If you require any information on any of our products please fill in the form below. 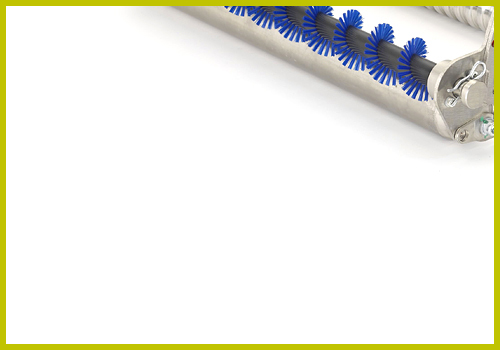 The TMSystem is a very clever design, very practical and easy to swap between the different tools. I would liken it to a formula one pit stop – straight in and straight out. My mechanic has also commented on how well engineered the cassettes are, and what good quality, from the metal itself to the ease of adjustment, but they are also very simple. The design has been well thought out, not just from a manufacturer’s viewpoint but also that of a Greenkeeper and a mechanic. 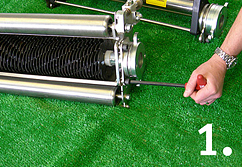 The UltraGroomer units were particularly good, they could be set to work deeper and take out more thatch without disturbing the surface. The finish is very clean, but a surprising amount of material is collected. 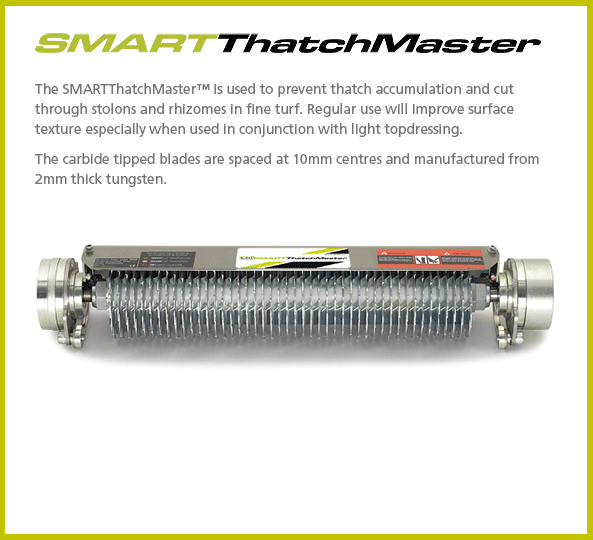 We have reduced thatch to a manageable level, so all that is needed is surface management of the sward. 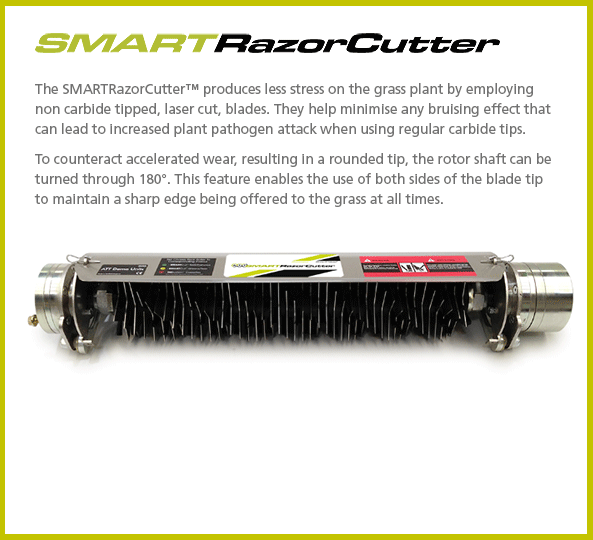 The SMART UltraGroomer does an excellent job. I wasn’t necessarily looking for a cassette based system but the build quality of the Ultra Groomer module caught my attention. 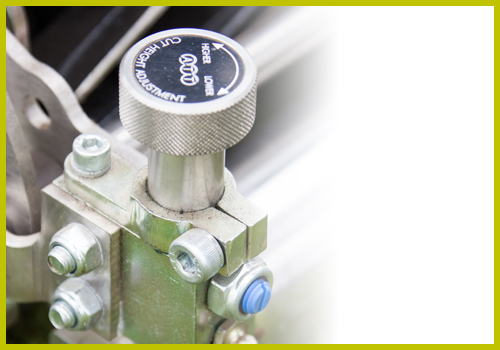 I was initially convinced a cassette based system must be a compromise against stand alone machinery but the demo really impressed us and that impression has stayed. I especially liked the idea that the system could be added to and that I didn’t have to buy the whole package in one go. The day of the demo was very wet, but we took the INFiNi out and created a great finish with the SMART UltraGroomer with no mess – everything went straight in the box. I take my hat off to the designer. He has used his experience as a Greenkeeper to come up with a machine that’s Greenkeeper friendly and ticks all of the boxes. 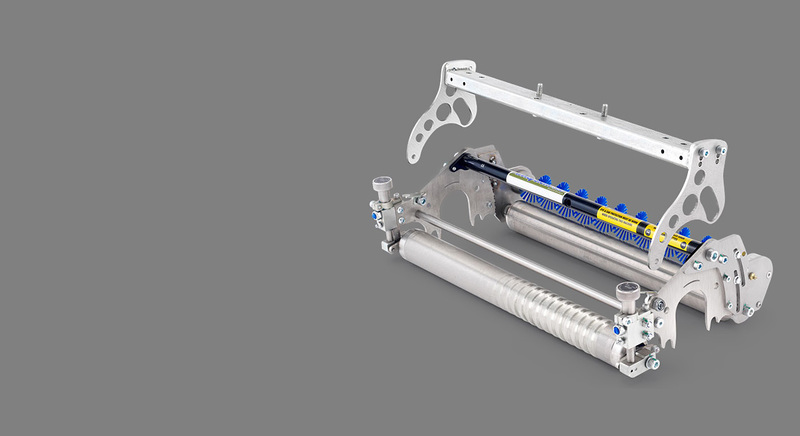 The ATT TMSystem™ offered a higher quality cutting cassette with more options compared to what we had before. The multifunction nature of the ATT cassette system was a double bonus. I think the cutting quality of the ATT SMARTCut cassette is absolutely superb and is very easy to set up. Altering the cutting height used to be a relatively lengthy task, but now setting the cuts can take someone as little as 10 minutes to complete. For me, the easy height adjustment is the unique selling point of these reels. 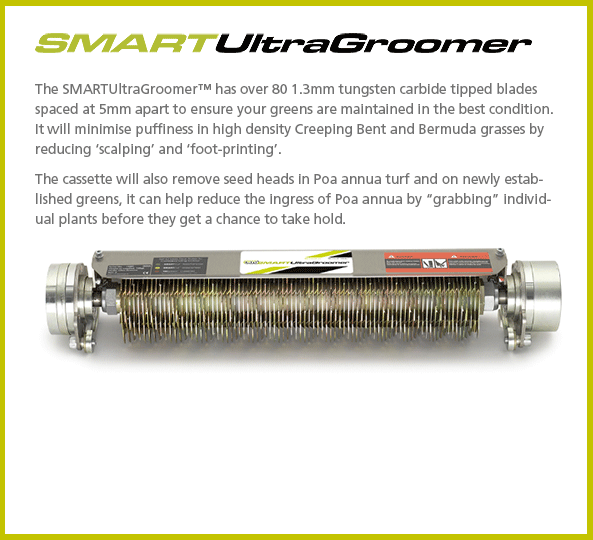 At my first club we had the full range of ATT SMART cassettes – Vibration, Verticutting, Brushing etc. They were so useful and versatile that I’ve managed to convince every employer since then to invest in them.